For most of us, this is probably not our favorite scenario, but there will come a time when it simply has to happen. Here's some tips to make it a little less painful. First and foremost, Leave the cotton at home. I don't care how warm and comfy that thick cotton fleece sweatshirt is.....it will feel like 5-10 extra pounds of dead weight if it gets wet. And if, by chance, the rain stops (and you still have a few more miles to go), that mass of sloppy fabric will not dry out. Do you think I'm kidding? Take a simple cotton t-shirt and a tech fabric shirt...get them both wet, and hang them out to dry. I am willing to bet a new pair of running shoes the cotton shirt will take much longer to dry (#eeewww). 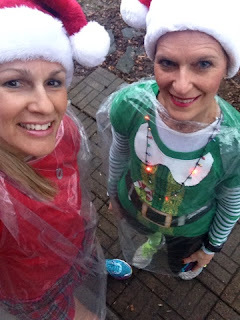 A lot of runners show up wearing a garbage bag. Yes, a garbage bag will cover most of your body and it will effectively repel water. But, garbage bags are kind of big and bulky. My solution? Use a dry-cleaning bag instead. A dry-cleaning bag is much lighter in weight, and guess what? If you're participating in a race, your race bib will actually show through it! I recommend not just splitting it open for the neck, but actually cutting a bit of a scoop neckline, as well as side slits near the waist so you can have access to your pockets or race belt underneath. I have a bag all rolled up and ready in my fuel belt, so I'm always prepared. Your feet will get wet, and so will your socks. I always wear wool socks (rain or shine) to help prevent blisters. 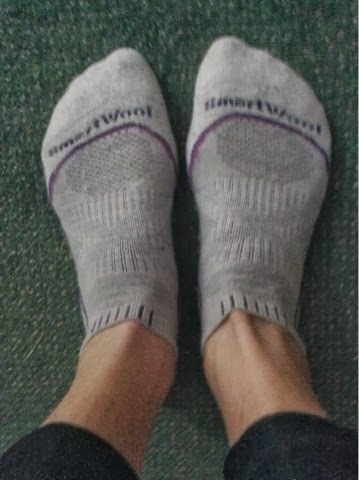 Did you know wool (unlike cotton) wicks away moisture from your feet? Again, leave the cotton at home. And while we're talking feet, go ahead and lube your toes, thoroughly. You can use brand name "glide" products, or plain old petroleum jelly will suffice. What about your hair? I'm not much a hat-wearer, but if it's raining (or in the forecast to do so), I will wear a cap. Yes, the cap will probably get wet, but it will keep your hair drier than a visor or a headband, and the bill will help deflect most of the raindrops. Also, ladies, consider wearing your hair in a braid instead of a ponytail...a wet braid is much easier to comb out than a messy, wet ponytail post race. As you are running, do proceed with caution. It's easy to focus on your own discomfort, but pay attention to the slick streets or slippery trails. Also, watch for puddles...they may be deeper than they appear. Even though, the rain kind of "levels the competition," be realistic with your goals. If you are hoping to PR or land an age group award, racing in adverse conditions may not be the ideal day for that to happen. Of course, there is the chance you may be able to run faster and stronger because you don't want to be out in the rain any longer than necessary. And, last of all, remember to smile! Having a good attitude will do wonders for your spirits. 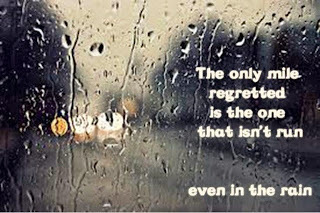 Although rain can make for miserable conditions, it also can make you feel like a beast for persevering through it . 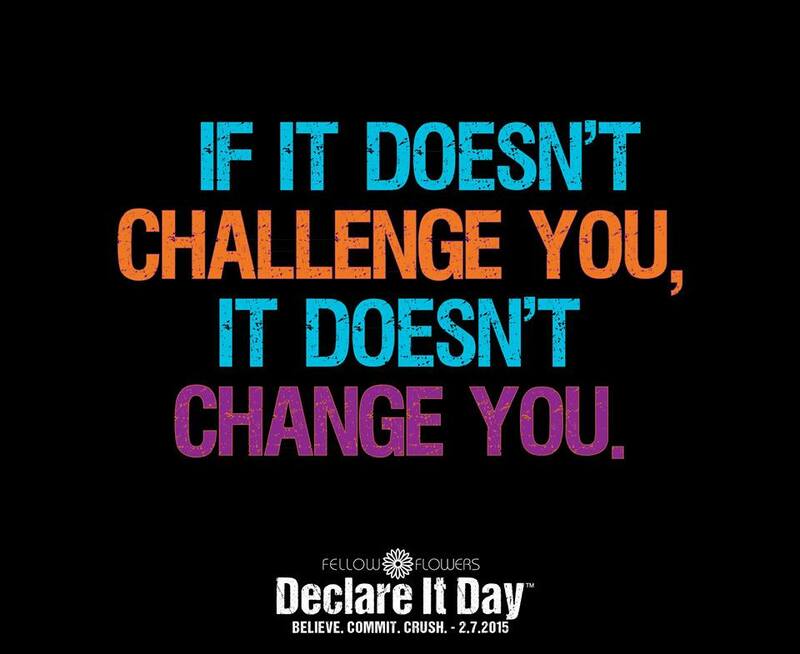 Have you ever trained really hard for a big race, only have it rain on race day? 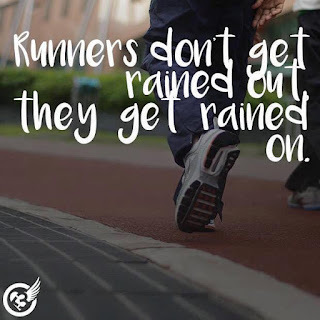 How do you feel about running in the rain? 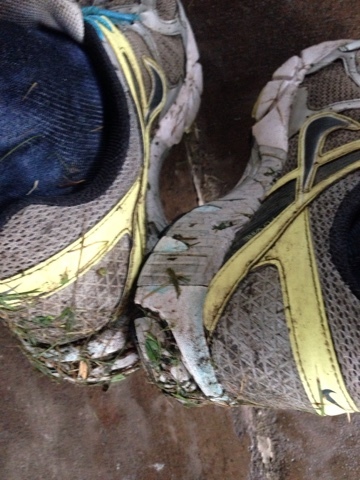 Ever wiped out on a muddy trail or slippery path? 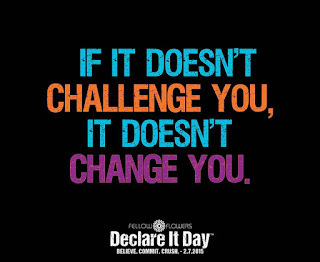 I'm linking this post with Deb from Deb Runs for the Wednesday Word...today's word is Encourage. Hopefully, I have given you some encouragement to go for a run in the rain and not stay inside. Head over, and see what everyone else is saying about the word Encourage. 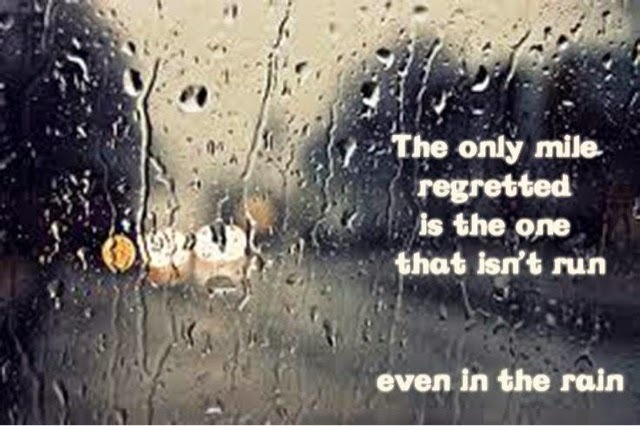 I don't mind running in the rain if it's warmed, but not real fond of a cold rain. Although I'd choose it over heat! I always wear a hat/visor to protect my face -- and wear sunscreen too! I've run plenty of times in the rain and it's not horrible unless it's pouring rain--then it hurts! I always stuff newspapers in my shoes after to help them dry out. Works great! I trained for my last full nearly having ALL my long runs in the rain, LOL! Caps and braids for the win! I actually wear a cycling cap under my helmet when I race in the rain. Keeps the water from above out of my eyes, although it doesn't do much for the water spray from the wheel in front of me. Good idea about the dry cleaning bags, too! This rain needs to stop now, though...getting old have rainy race days every weekend! Dry cleaning bag is a great idea. I HATE running in the rain, and unfortunately have been caught a couple times. And agree with you about those puddles.... it can be really dangerous. I actually love running in the rain! It's so refreshing and fun. Plus the trials are always super empty and I feel so badass going out while everyone is going to the gym instead! 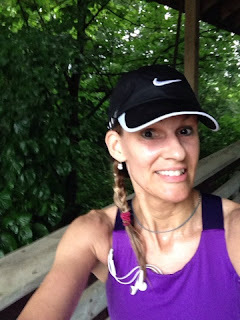 I haven't had horrible conditions on race day, but I have had some rainy runs. A hat is key for me to keep some of the rain drops off my glasses! I sometimes wear my sunglasses even if there's no sunshine...just to keep the water out of my eyes. Great tips!! I always try and remember to braid my hair when I'll be running in the rain. If I forget, I may as well record combing my hair out post-run as an upper body workout, because that's basically what it is! It's refreshing when it is hot. Otherwise, I don't like it. I always wear a baseball cap. I don't wear a water repellant jacket because it's too hot. I keep my phone is a plastic bag.